Je préfère ce château aux autres châteaux. I prefer this castle to the other castles. Le bateau rouge rejoint les autres bateaux. The red boat is catching up with the other boats. Andréa mange un gâteau, et je mange trois gâteaux ! Andrea eats one cake, and I eat three cakes ! Cette couronne a un joyau bleu et deux joyaux rouges. This crown has one blue gem and two red gems. 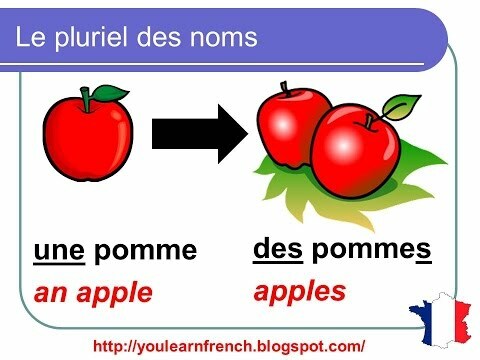 Note that nouns ending in -au, -eau take an -x in the plural form, and not an -s.
How is the question "What does ''noyau'' mean?" relevant to the lesson? And where is the answer to be found in the lesson? It was one of the questions in the micro-quiz. 'Noyau' is one of those words ending in 'au' whose plural is a silent 'x' .